An air compressor is a basic fixture in most well-equipped woodworking, metal and automotive shops. 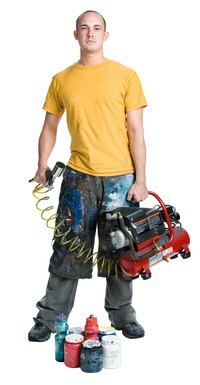 They can be used for a number of tasks, from painting to powering a wide variety of tools. Use motor size, maximum airflow and reserve air capacity to determine an individual machine's suitability for individual tasks. Once you've decided on the right compressor for your application, determine the cost of running one of the machine with a bit of research and a couple of simple tools. Determine the compressor's running time. Under normal operational conditions, an air compressor cycles on and off throughout the day. Because it only draws power while the compressor motor is actually running, use a clock or stopwatch to keep track of the number of hours and minutes it runs during the work day. Calculate the compressor's power consumption. The wattage rating is usually stamped on the motor's metal nameplate. In instances when only the amperage rating is given, determine watts used by multiplying the voltage by the number of amps. For a compressor operating on standard household current, the voltage is 110. Heavy-duty compressors operate on 220-volt current and require special wiring and outlets. A 110-volt compressor drawing 15 amps uses 1,650 watts (110 volts x 15 amps), while a 220-volt compressor drawing 15 amps consumes 3,300 watts (220 volts x 15 amps). Multiply the wattage by the running time to determine the kilowatt hours used. If a compressor drawing 3,300 watts operates for three hours, it consumes 3,300 watts x 3 hours = 9,900 watt hours. Divide this number by 1,000 to get 9.9 kilowatt hours. Discover the cost of running the compressor by multiplying the kilowatt hours used by the rate charged by your utility company. Using a rate of 7.2 cents/kWh, the example of 9.9 kWh comes out to 0.072 x 9.9 = $0.71 -- or 71 cents -- for three hours of running time. Averaging daily use for at least a week can give you a more accurate picture of monthly electrical consumption.